Question: why is red tape red? Why can't it be a soft, pale blue, say, or vibrant tangerine? Being colourist aside, there's nothing fun about red tape. Unless of course, you're comedian Joe Lycett, who decided to write a book about his adventures in being wrapped in the stuff, and how he decided to deal with it. Lycett, who can often be found on our TV's propping up the usual comedy panel show, clearly has a devilish side. When confronted with a situation that most may just lie down and accept, Lycett stands up to, as it were, with electronic missives. 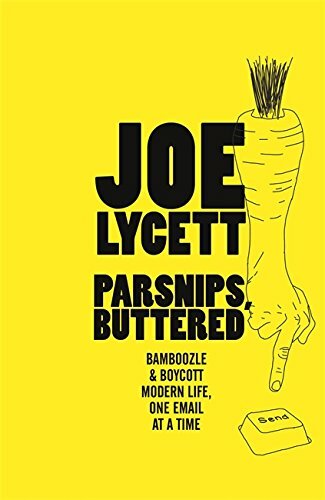 For instance, where most will begrudgingly accept a parking fine, Lycett challenges them, with a wit as sharp as the sharpest tool in the box, an unsettling humanity, and disarming dark humour. it clearly gets results, if only to be part of this entertaining collection. In essence, it's a book of relationships, usually short, sweet and/or sour, where the comedian trades dialogue with individuals, who are often representing larger companies, with genuinely amusing replies on both sides. It's a simple idea, but makes for entertaining reading. That said, it doesn't take much to unsettle his targets, but that's part of his charm. And even when the gig is up, he still manages to keep the laughs coming. It would be so easy to make a lot of these stories up, but Lycett comes across as the type who would find that particular route too much like hard work. Oddly, the truth is the short cut and turns out to be the quickest way to the quips. And if you needed proof, he includes some of the emails/correspondence from his larks, which again, would prove too much work to mock up. As well as this evidence, Lycett also includes some crude illustrations, and although many of them look like they were produced by a pencil attached to a poorly hedgehog as he torturedly went back and forth across the page, they also have a sweet appeal all of their own. If you've ever fallen foul of some despicable red tape, or felt that you've been wronged in some fashion, this book may well be just the ticket to help you right that wrong. And if not, you could just warm yourself in the fuzzy glow of someone who did.